Outage reports vastly ebbed after 10 a.m., and Verizon confirmed the problem had been resolved by 11 a.m.
A widespread Verizon wireless network issue left "a ton" of East Coast users unable to send or receive text messages early Tuesday, the company confirmed via Twitter as it responded to a series of frustrated messages. It wasn't immediately clear when the outage started or exactly how many customers were affected. Down Detector's outage map showed virtually the entire East Coast a blazing red. While Verizon did not confirm the scope of the outage beyond the Eastern seaboard, parts of the midwest, including Illinois, Ohio and Indiana, also reported service outages. It appeared to peak around 4,350 outages reported at 9 a.m. -- yet many customers still reported issues. 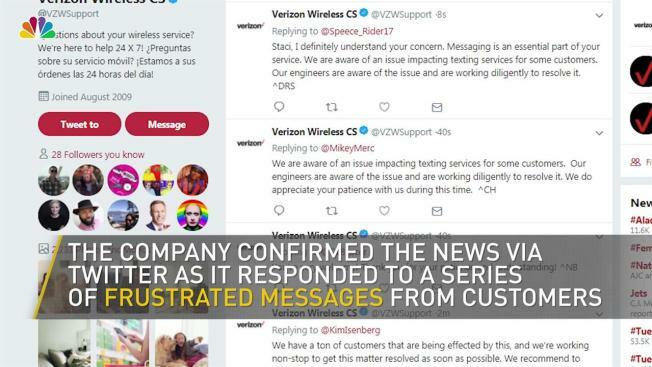 Verizon Wireless' verified customer service Twitter account appeared to be responding to a half-dozen tweets a minute for at least two hours. One of the responses: "Verizon is currently experiencing a wireless network issue in many eastern areas. Our technicians are aware of this issue and are working to resolve it quickly. We apologize for any inconvenience this causes. *NXS"
A growing scam involves stealing your cellphone number -- it's called unauthorized porting. Lynda Baquero has the info on how to protect your account. Another: "We know how important it is to have working service, and we're on it! We have confirmed there is a texting outage on the east coast. Our technicians are fully aware we have a ton of customers that are being effected (sic), and we're working non-stop to get this matter resolved. *IXR"
At one point, Verizon was suggesting people fully power down their phones and turn them back on a few seconds later. It wasn't clear if that fix was working, but a handful of users who did have their issues resolved were sprinkled in with the complaining tweets. Outage reports vastly ebbed after 10 a.m., and Verizon confirmed the problem had been resolved by 11 a.m. It wasn't clear what caused the network issue.